More generally, BDS represents a continuation of an ongoing campaign promoting political subversion and economic warfare against the State of Israel irrespective of the territories in dispute between Israel and its Palestinian neighbors. In fact, during the past decade, these broad international efforts – known as the delegitimization campaign – have sought to undermine Israel’s existence as a sovereign state. Moreover, this global crusade operates in the political, legal, academic, cultural, and economic fields, and has been characterized by “direct action” measures such as “humanitarian aid” flotillas, as well as other activities such as “die-ins” and precoordinated demonstrations and protest marches primarily in European cities and on North American campuses. In Western circles, BDS is commonly misunderstood. It is generally viewed as a progressive, nonviolent campaign led by Palestinian grassroots organizations and propelled by Western human rights groups, who call for boycotting Israeli goods produced in the “occupied” or “disputed” Golan Heights and West Bank territories captured from Syria and Jordan respectively in the 1967 war. It is also widely assumed that the global BDS movement is further limited to boycott and divestment aimed at Israel’s presence over the 1967 Green Line, resulting in international actions led frequently by the Palestinian Authority at the United Nations, at the UN-affiliated International Court of Justice, as well as petitions made to the International Criminal Court. However, a closer investigation of the BDS movement reveals a starkly different picture. BDS is more accurately described as a political-warfare campaign conducted by rejectionist Palestinian groups in cooperation with radical left-wing groups in the West. 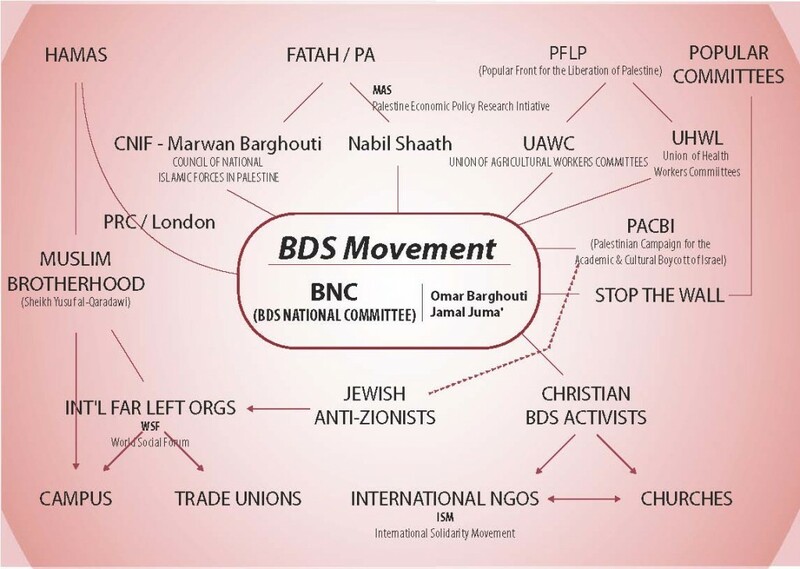 BDS leaders and organizations are also linked to the Palestinian Authority leadership, the radical Muslim Brotherhood, other radical groups, terror-supporting organizations, and in some cases even terror groups themselves such as Hamas. BDS boycott campaigns have effectively misled trade unions, academic institutions, and even leading international artists and cultural icons, with seemingly earnest calls for “justice” entailing the establishment of a Palestinian state living beside a Jewish state. These BDS supporters have been led to believe that the combined pressure of boycotts, divestment, and sanctions will force Israel to withdraw to the 1949 armistice lines, otherwise known as the 1967 Green Line, enabling a resolution of the ongoing Palestinian-Israeli conflict.6 However, as some commentators – including the New York Times’ Roger Cohen and Professor Norman Finkelstein – have pointed out, the BDS movement seeks to eliminate Israel even before addressing the Palestinian issue. Understanding the maximalist goals of BDS presents a challenge to policymakers, shapers of public opinion, and Middle East observers alike. The movement has exercised tactical sophistication in “dressing up” its radical linkages and extremist ends in a language of peace, justice, and human rights that appeals to Western audiences. This monograph seeks to uncover how BDS is used by Palestinian groups and other radical organizations that have misappropriated the language and cause of human rights in their ongoing attempts to vilify, criminalize, and delegitimize the State of Israel. This study also brings to light the BDS movement’s ultimate goal: far from promoting a negotiated solution to the decades-old Palestinian-Israeli conflict based on the rights and requirements of both parties, the global BDS crusade seeks the dismantling of Israel and its replacement with another Arab-majority state.